Tom O’Donnell is the author of the Hamstersaurus Rex series as well as Space Rocks and its sequel, Space Rocks 2: For the Love of Gelo! 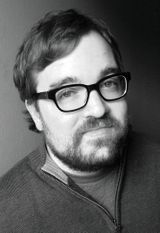 He has written for the New Yorker, McSweeney’s, and the show TripTank on Comedy Central. His comic strips have been featured in the New York Press and the Village Voice. He lives with his family in Brooklyn, New York. Read more at www.tomisokay.com.